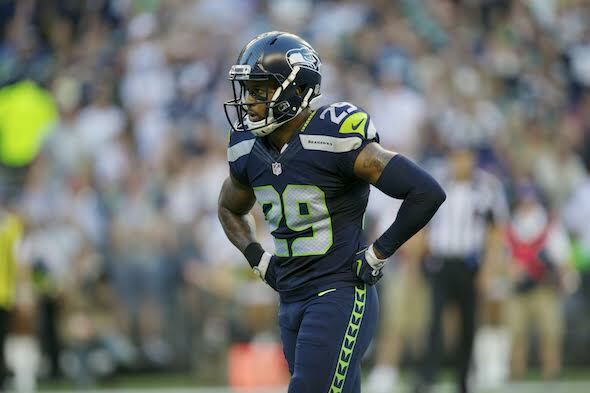 Departures outstripped arrivals in the first day of NFL free agency, but the Seahawks’ long-term strategy pivots on keeping Earl Thomas signed and happy. Most of us in these parts can cope with sprinkles, showers and steady rain. But the deluges that accompany thunderstorms elsewhere? No. Too much nature all at once. Old Testament-style weather doesn’t fit a tech city that naively assumes it’s in control of some things. At least, that’s my analogy to explain how it seems at the moment to be a 12 after watching nine Seahawks shown the door over the past 10 days, including two longtime stalwarts for little to nothing in return: A dreary deluge. The water level seems to have reached the collective lower lip, which trembles. But until the list includes FS Earl Thomas, nobody’s drowning here. Having said that, feel free to indulge a rib-rattling cough. CB Richard Sherman was cut for no compensation and signed with the 49ers. DE Michael Bennett was traded to the Eagles for little. TE Jimmy Graham (Packers) and WR Paul Richardson (Redskins) were free agents that the Seahawks chose not to afford. The Seahawks wanted to keep CB Deshawn Shead (Lions), but he escaped for a more lucrative deal. Two running backs, Thomas Rawls and Mike Davis, were restricted free agents released into free agency because they had no trade value. DT Sheldon Richardson remains a free agent, as is CB Jeremy Lane, although news came Wednesday that he was signed up by King County Superior Court — for a March 26 date to discuss a DUI. The commencement of NFL free agency Wednesday offered little immediate rescue for a constituency soaked with disappointing news. The Seahawks did break a pattern of not making first-day additions by agreeing to a two-year deal with one the best names in sports, DE Barkevious Mingo. He will join his fourth team in four seasons (he started six times for the Colts in 2017) to add defensive line depth, or maybe he’ll stand up and be a linebacker. The Seahawks did re-sign three of their own free agents whose contributions were somewhat under the radar but still valuable: Defensive backs Bradley McDougald and Justin Coleman — both were part-time starters who were new last season — and DE Dion Jordan, who was a bit of a revelation as a pass rusher in the final five games. Looming over this bewilderment of comings and mostly goings was Thomas, the last Legionnaire standing from the Boom days. He’s not a free agent. But he is the pivot point. After the departure of Sherman and perhaps a career-ending injury to Kam Chancellor, Thomas looms as the guy holding together the back end of the defense, the most important element of a Pete Carroll team. He is upon his final contract year, making $10.4 million. He’ll be 29, remains healthy and still at the top of the list of premier safeties in the NFL. He has said during and after the season he wants to be paid like it in a multi-year extension. At the moment, Kansas City’s Eric Berry is the highest-paid safety at $13 million annually. A report Wednesday from a Dallas media outlet said the Cowboys, whom Thomas told in December to “come get me,” made an inquiry. The Seahawks reportedly wanted the Cowboys’ first-round draft pick, 19th overall. But that’s not going to happen with a single year remaining before Thomas can be a free agent. If the Seahawks don’t change their minds, logic says that much of the shedding of Seattle salaries going on right now is to help create room under the salary cap to attempt to extend Thomas’s deal, then do the same for a key player on the offense, LT Duane Brown. There’s speculation that a commitment was made to Brown, who gets $9.75 million in his final contract year, as part of the deal that brought him in trade from Houston in exchange for a second-round pick (2019) and a third-round pick (2018). If the savings from the current purge goes largely to pay Thomas and Brown, the remaining amount available under the cap isn’t likely to allow the Seahawks to be big players in the free agent market. And they’ve already nibbled at that with $6.8 million to Mingo. But the virtue here is that Thomas and Brown are healthy, premier talents known to the Seahawks, which seems at this point a better outcome than investing in another round of cheaper, damaged goods such as Eddie Lacy and Luke Joeckel from a year ago. Regarding the lack of return on the departing talent, it is a fact of NFL life that the Seahawks have largely postponed in the Carroll era. Some fans may be new to this thrilling walk along the cliff’s edge, but the cruelty of the NFL’s hard salary cap often leaves no better route. A quick glance around the NFL lately discloses a number of familiar names who, as with Sherman, were jettisoned for no return: DT Ndamukong Suh, WR Danny Amendola, WR Jeremy Maclin, CB Tyrann Mathieu, TE Eric Ebron, TE Julius Thomas, WR Jordy Nelson, RB Jonathan Stewart, RB DeMarco Murray, for starters. The retort of “everybody else does it” will not satisfy the battalions of Sherman fans any more than it does a parent when her kid breaks a window with a rock. But Sherman’s contract and injuries pushed him toward the door, and the Seahawks would have been foolish long-term to do anything but bid him farewell. Still, the departure put an additional premium on the value of Thomas. So if the next few days, you see Thomas pulling on another team’s jersey, feel free to pull on a life preserver and keep track of the shoreline. Remember how Carroll liked to brag about the number of his UDFAs who contributed? That’s not working so well either lately. I think they’ll give Thomas what he wants as long as what he wants is not a three year deal that is TOTALLY guaranteed to a guy who somewhat-recently broke his leg. Health is always a risk taken in an extension for a veteran. The guaranteed money has to be paid early, so he can be cut as was Sherman. So going down the list, are any of us crushed by these departures from a football perspective? It’s a business (deep down, we all know that) and tough decisions must be made. Maybe Bennett and Sherman have another year or two left in the tank, but possibly not. Anyone going to miss Jimmy Graham mailing it in half the time? Does anyone else who left rate more than a “meh”? I hope the Seahawks are indeed focusing on Earl, Sheldon, and Duane. Whether they can keep them, don’t know. And Father Time remains undefeated…so ship a year too early, rather than a year too late. That has been Belichick’s theme, and one I posed a few weeks ago about Russell Wilson. In 2020, can the Seahawks afford to pay him his third contract at $30M+ annually guaranteed and field a credible team? Not if they continue to draft as poorly as they have. They have to keep Duane and George or I can’t take it anymore . . .
Barkevious Mingo, Hawthorne Wingo, Jim Ringo, Van Lingle Mungo (am I showing my age? )…this was a depth move. Sherman and Bennett – unlike what certain ex quarterbacks may be saying on two different radio stations in town – are gone simply because of money and age. Graham couldn’t block. Lane? Lost whatever “it” he had. As a wise man once told me, “Every show that has ever been on Broadway has closed…except the ones that are open tonight.” This was a team that excelled with a cheap, stellar quarterback and cheap stellar, unexpectedly talented defensive players (otherwise, they would have drafted Chancellor and Sherman higher than they did). That’s a hard act to follow, especially when the now-expensive quarterback is taking well over 10% of available salary for 53 players. Heavy pressure is on making this draft work. Rock is on the left; hard place on the right, and a waterfall is just ahead. Another well-thought-out observation. There are no easy choices when things get old/broken/expensive at once. I think that was Mungo Jerry. But it’s certainly better than Der Bingle buh-buh-buh-bleating his way through Baubles, Bangles, and Beads with Alex Karras’ Mongo, who was just pawn in game of life. Don’t shoot Mongo, you’ll just make him mad. Row row row your boat gently down the sea…. I felt the same way when the “Come Get Me” story about Earl Thomas emerged. Point is, I understand these guys are human beings, and as they grow and expand their knowledge and life experience, particularly within a bubble of successs, almost no one remains all in. It’s not their fault. It’s not really even a fault; it’s just the natural order of things. But it’s bittersweet because there’s a certain innocence to buying into the team completely. And more often than not, that innocence resides within young hungry players who are climbing to the top. Teams with more of those guys tend to start winning. I think they’re at least more fun to watch. Sustained success comes to organizations that can recognize the turning point, when maybe the hand doesn’t go up to smack the sign as enthusiastically as it used to. And then have the stones to let that player go – not because you no longer think he’s great, or because you don’t love him… because it’s just time. Great observation, perhaps as good an evaluation metric as any. They have talent just to get to the NFL, but those that “buy in” to a greater degree than their peers, not always an easy thing to do, seem to have that extra edge. True, and as Matt points out, the well of “all in” is not infinite. Well written, Matt. You understand how young athletes change as they grow older and begin to learn they aren’t indestructible. Every coach knows that most veteran players grow weary of the rhetoric. As you point out, it’s not bad or wrong, it’s just human nature. I like your use of the All In sign. Great point. May I steal it? Full credit to you if I do. I do wonder where Earl plays into the Seahawks future. They seem to have 3 options: pay him more than any other Safety in the league; not pay him and let him go for nothing at the end of the year; trade him now for whatever they can get. I’m not sure that paying him keeps in line with their “only gonna get worse from this point on” strategy that pushed a still productive Bennett and Sherman out the door. Similarly, paying him and resigning McDougald leaves no spots open for last years drafted Safeties which was a stated priority by JS. Earl has been my favorite player on the team, but I just don’t see how he fits and doesn’t later become a contract we regret. We have to learn to live without Area 29 sometime and now is a better time to transition than we will likely see again. It’s the end of era, lets get the next one rolling. I think even Earl could agree with that. Reasonable points. A three year deal for Earl at 29 would still give the Seahawks most of his prime. They can structure to pay most of his guaranteed money early, giving them flexibility to cut him later as they did Sherman. Would Earl accept that? Perhaps if the first year made him the highest paid safety. If I had to pick a guy among the defensive core to extend, it’s him. He cares about football and getting paid, period. And he would hold together the defense until the next generation is ready. The “game” is too brutal. Where is the “sport” in a litany of broken bones, ankles, knees, arms, elbows and necks? Money, the root of all evil, who has it and who doesn’t, will be the death of it. They said that about boxing, later about cage matches. Still going. Are you not entertained? sure..but it would be great if there was a way to preserve the entertainment and avoid the damage to mind and body. Its all so gladiatorial, this spectacle we call NFL Football. It all feels a bit like old Rome to me..Thumbs up and Thumbs Down..with our own little Nero fiddling while Rome burns. Earl Thomas’ situation today mirrors Sherman a year ago. Saw that story. This could be high drama over the next few days. You’re right about Cousins. The NFL has crossed a significant threshold. Nobody is going to offer a first round and third round picks. It’s like last year, asking too much and getting nothing.